The Functional Skills for Kids is a 12-month long series written by occupational and physical therapy bloggers on the development of 12 functional skills for children. 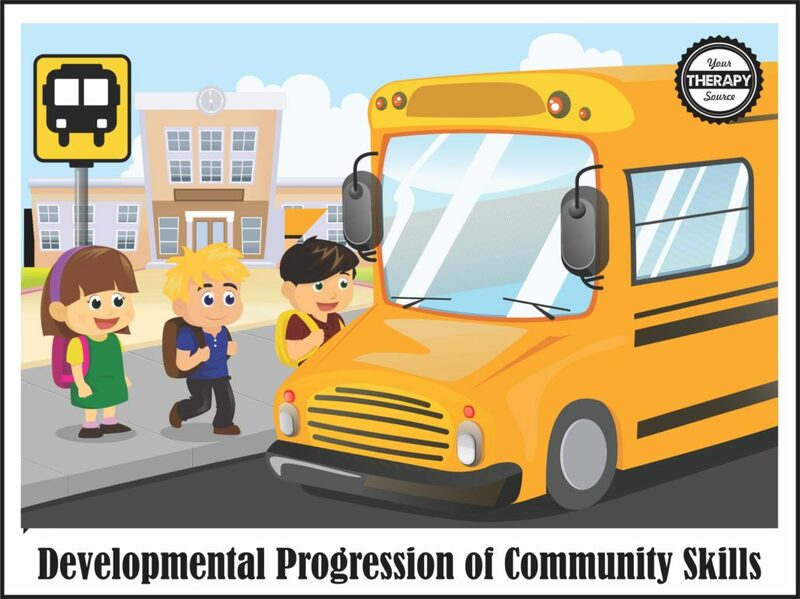 This month the topic is community skills and this post will discuss the developmental progression of community skills. Each month throughout 2016, we will discuss the development of one functional skill in children addressing the many components of that skill. The ability to complete the functional task of navigating the community develops along a continuum. Children need motor skills, visual perceptual skills, balance skills and safety awareness to be independent in the community. 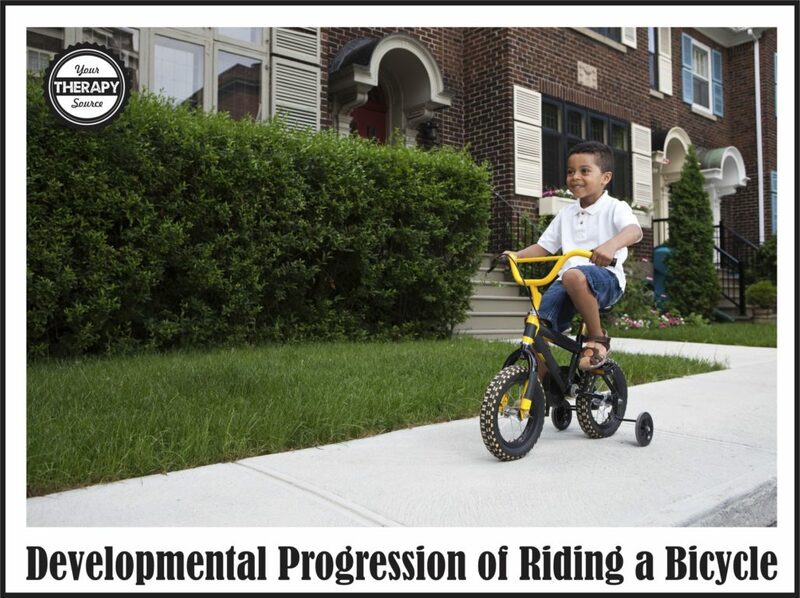 The developmental progression of the following community skills will be addressed: walking up/down ramps, curbs, different surfaces, bike riding, crossing streets and on/off different modes of transportation. After children have moved through the developmental progression of rolling, crawling, standing and walking higher level motor skills begin to be mastered. 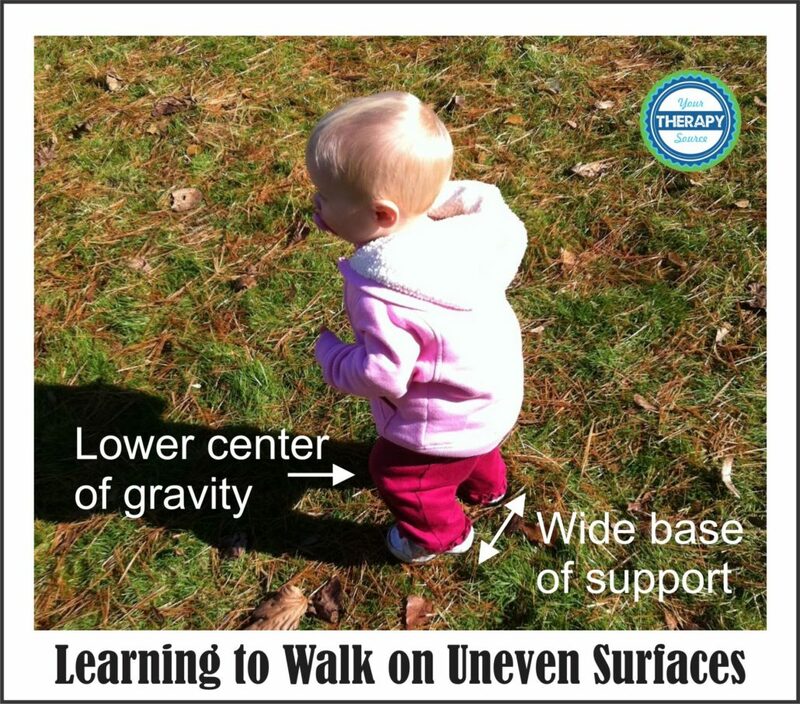 Children normally learn how to walk on level, flat surfaces. When the flooring changes from hard flooring to rugs children need to adapt and lift those little legs just a little higher to clear the rug. When a new walker heads outdoors, uneven surfaces require additional righting reactions and balance skills. The feet tend to separate to widen the base of support and the knees may bend to lower the center of gravity. Around 18 months to 24 months+, some children will begin to step on and off a curb without a hand hold. Jumping down from the curb (with one foot leading) quickly follows. Children develop the ability to safely go up and down ramps around the same developmental age. Children can swiftly and safely run up and down ramps around 2-3 years of age. First, children learn how to propel a ride on toy around 18-24 months with their feet and progress to pedaling a tricycle around 36 months of age. Around 5+ years of age, most children have developed the coordination, balance and motor planning to ride a bicycle without training wheels. At this age though, safety awareness is a concern in terms of avoiding obstacles and cars so close supervision is a must with significant practice time. Around 6 years+ of age, children begin to develop improved safety awareness but are still at risk for injuries and can use hand brakes. Around 9-12 years of age, children can shift gears on a bicycle and are fairly aware of traffic laws. Children under age 10 ride primarily on sidewalks, playgrounds, and neighborhood streets. Bicycle riders over age 10 are more likely to be found on neighborhood streets, bike paths, or major thoroughfares. look left, right, then left again before stepping into the street. cross the street at designated crossings. cross only when there are no cars coming. walk on the side of the street facing traffic if there are no sidewalks. be extra cautious when crossing where cars are parked on the street. walk on the sidewalk or along the side of the road until you are five giant steps (10 feet) ahead of the bus if you have to cross the street before getting on the bus. make sure the bus driver can see you and you can see the bus driver. never try to pick it up anything you dropped until you get permission from the bus driver. Children will develop at their own pace independence with life skills through education and practice. Stop by to see what the other occupational therapists and physical therapists in the Functional Skills for Kids series have written on the development of community skills. This post is part of the Functional Skills for Kids: 12 Month series by Occupational and Physical Therapists. Read all of my monthly posts in this series HERE. Need to track progress regarding an individual’s independence with various life and community skills such as safety awareness, transportation, community skills and more? Check out Life Skill Checklists. Pre-Vocational. FIND OUT MORE INFORMATION. Boyse, K (2009). Safety Out and About Walking, Biking, Scooter, School Bus and Shopping Cart Safety. Retrieved on 7/26/16 at http://www.med.umich.edu/yourchild/topics/outabout.htm. Rodgers, G. Ph.D. Bicycle Study – Consumer Product Safety Commision. Retrieved on 7/26/16 at http://www.cpsc.gov//PageFiles/112701/344.pdf. Teaford, P et al (2010). HELP® Checklist 3-6 Checklist. VORT Corporation.